Are Some Facts of Manufacturing ERP Useless? Everyone likes to back up decisions we make and ideas we have with facts. It makes us feel that we did our due diligence, weighed options and made a commitment based on valuable reasoning. But what happens when the presentation of facts is out of context or hinders the meaning behind them? Instead of simply taking what is being said as the end-all-be-all, the trick of the consumer is to remember to look at the source for clues in differentiating germane from immaterial fact. Case in point: Recently, on the technical forum, IT Toolbox, someone posed a question about experiences and variances between IQMS and MS Dynamics. This fairly innocuous question was posed with the idea that people who know about these two manufacturing ERP products would provide feedback and help to make a few choices clearer. That started out well with good conversation, some real world examples and a couple statistics thrown in. Then they hit a snag. After one specific statistical figure posting, someone else felt compelled to dispel that figure by offering a much varied figure - for something entirely off the subject. One thing led to another and now we have many posts, so far from the original question, that no one even remembers what we were discussing in the first place. In this case, the source of some posts was someone who clearly had an agenda for what they wanted to say and was willing to shoehorn in that idea regardless of the relevance. Was their comment valid? Perhaps, in the right forum it might have even been helpful. But providing the information at that time, in that way, rendered the "fact" basically useless. How can facts that are true be irrelevant at times while meaningful at other times? Isn't a fact always something you should have at the ready to help solve a decision? The theory is yes, but if the fact isn't provided as a fact, it can become noise. For example, I just finished an interesting article titled, "Time to Stop Believing in Ghosts," about the (as they put it) "ghost" issue of unintended acceleration in automobiles. 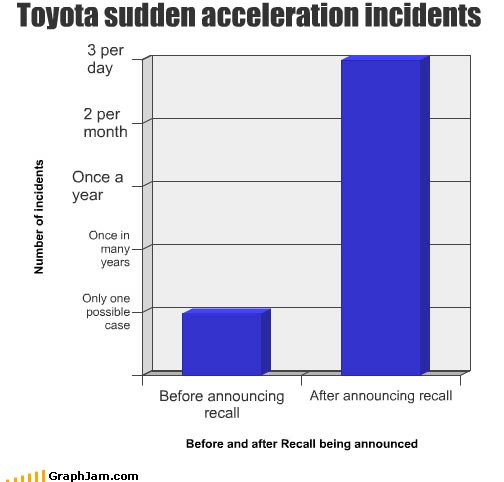 We all remember the Toyota stories from the media talking about cars going out of control and the tremendously expensive recall the automaker faced in the wake of these incidents. The media reported it, so it must be fact. Toyota fired back with research of the impossibility of this happening. The media continued to discuss the recall and increase in accidents. This article presents the scientific, unequivocal, electronics expert-backed version of the truth in that unexpected acceleration is impossible. This is the same information I heard on the evening news at the height of popularity. The difference? The magazine didn't just brush over this fact. The news did. It was a brief mention between the longer stories of destruction. Like the online posting issue, the media rendered the "fact" basically useless. Am I saying that the Toyota event didn't occur or that the person posting on IT Toolbox was wrong? No. But just like with selecting an ERP, you need to understand what is true and what is relevant. ERP Company 1 may have 10 times more employees than ERP Company 2, but how many are going to work on your account and be accountable to you? Isn't that the fact you care about? ERP Company 1 may make 10 times more than ERP Company 2, but the smaller company puts 75 percent of its revenue back into programming and development while the larger company puts 90 percent of its revenue back into the pockets of its Board of Directors. Which fact helps your company? ERP Company 1 has 100 programmers working on 10 various packages while ERP Company 2 has 20 programmers working on the one and only package they produce. Which programming team do you want? Listening to the facts, statistics and information provided to you is only as good as the analysis you put into it. Some facts, just at face value, may not show the whole picture.